Grand Master Narrie Babao was in Las Vegas 9/4/12 with his lovely wife Zena Sultana Babao celebrating 37 years of marriage. I was invited by Tuhan Lindsey Largusa to attend an informal get together of instructors and friends here in Las Vegas at a Starbucks coffee house. Grand Master Babao Arnis system was named after the late Buenaventura “Turing” Babao, the late father and original Arnis teacher to (GM Narrie Babao). Master Turing learned the Batangas Baston system of Arnis from Ka Juan, who once rode with General Miguel Malvar, the last Filipino general to surrender to the Americans in 1912. 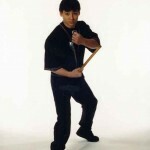 At present, under the Babao Arnis system, he teache’s three separate systems: the Batangas Baston, the Villabrille-Largusa Kali, and the Cacoy Doce Pares Eskrido and Pangamot. Additionally, he teaches kuntao (empty hands), sikaran (kicking arts) and panuntukan (Filipino boxing). I would like to personally thank Tuhan Largusa for the invitation to meet GM Babao and the Master himself for sharing his knowledge of the Filipino history, culture and technique of his art.